Yesterday I spent the day in Louisville, Kentucky with the express purpose of soaking up some baseball. 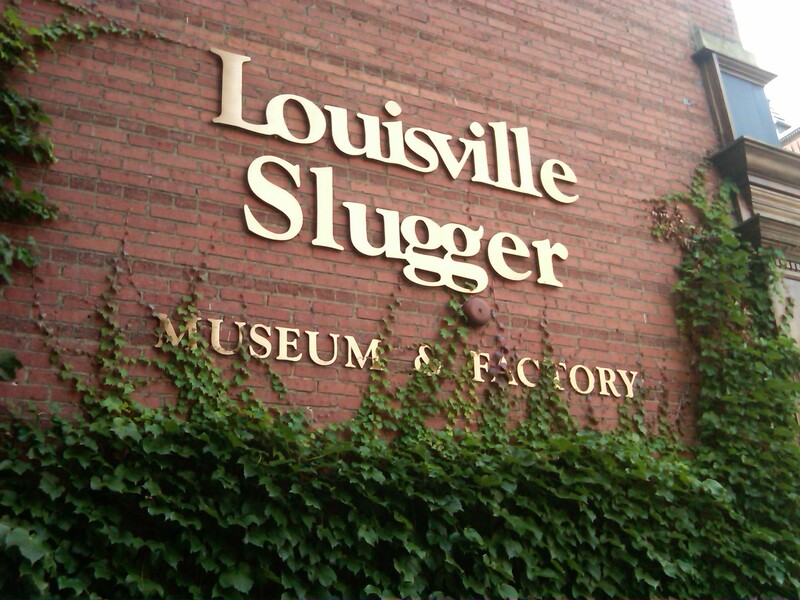 The first part of the day was spent at the Louisville Slugger Factory and Museum. I may go into that a lit tle more in depth later in the week. It was a great time though. 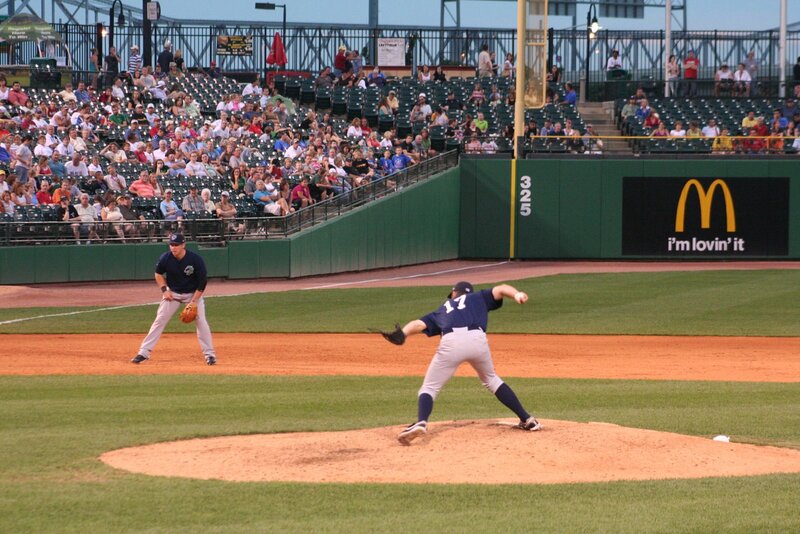 The second part of my trip was to see the Charlotte Knights visit the Louisville Bats at Louisville Slugger Field. First off let me say that the field really is great. I have been to some great stadiums this year, and this one ranks right up there. I have gone to three Triple A stadiums this year, and the Bats have been a part of every one. At this pace I will be a closet Reds fan in no time. Before the game started I was able to meet a few of the Knights. Most of them were really nice. Josh Fields was also on the field signing so I went up to him. He was very cool talking with everyone, but as the fans walked away they were greeted with a surprise. He really was not trying in the autograph department. I gave him a perfectly good ball to sign, and he signed it on the stitching so small you could not see anything. Sometimes a player can do more harm by signing than by not signing. Jack Egbert on the other hand gave me a great auto right on the sweet spot. I wish much success to Jack, and I also hope that Josh gets his wish to be traded. After Fields ruining the ball I was done trying to get autographs. I watched former Sox player Rich Dotson sign card after card for three grown men, and then snub a kid. These guys had the setup, and obviously were just getting them to get rid of. The kid just wanted Dot’s signature. Well the card shop men won. Way to go Rich. It was a beautiful night for a ball game so I sat down with my Parmesan Garlic Fries (a local specialty), and settled in for some baseball. This would be my second matchup between the Reds and the White Sox this season. The first was at the Great American Ballpark for the Civil Rights Game in June, and this one involved their top farm clubs. 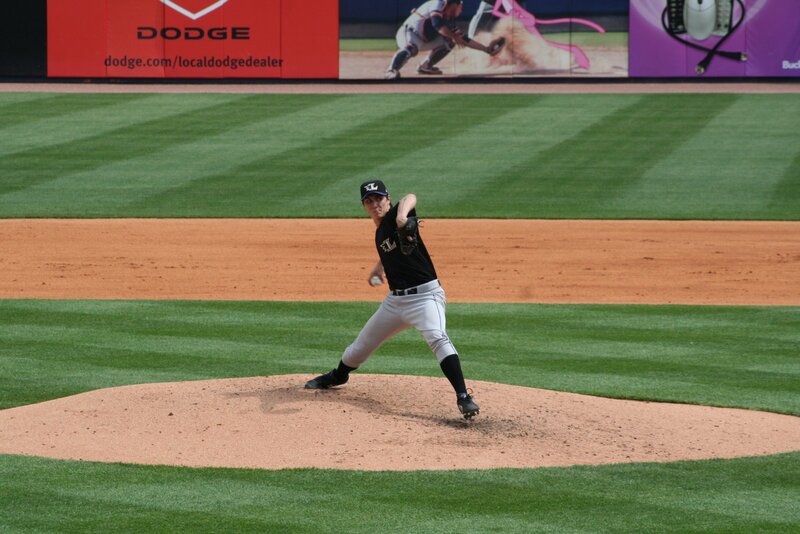 Carlos Torres was on the mound for the Knights against Matt Maloney for the Bats. Both of these guys have had a cup of coffee in the bigs this season. Right aw ay I knew that I was in for a great matchup. Torres went six innings giving up two runs on five hits, and striking out six. At times he looked overwhelming. Then he would miss badly, and the ball would get crushed. In the first innings he gave up a hard double to Louis Bolivar, but pitched out of the trouble. In the fourth he made Kevin Barker look terrible on one pitch, then left the next one over the plate. Barker sent the ball the other way 446 feet. It was a monster shot. Maloney was not too shabby himself. He went 6 2/3 giving up three runs on seven hits. He also struck out five while only walking one. He gave up a couple of home runs, but for the most part was very solid. This was not the pitching exhibi tion that you normally get at a minor league game. I have only been to two Charlotte games in my life, but Carlos Torres has pitched them both. On the flipside I have been to three Louisville games, and Maloney has pitched in two of those. If I remember right he was pitching with the big club in Cincinatti the other time I saw the bats. They both appear to have good stuff. I guess you don’t make it this far without it. The small improvements from here will determine where they go from here. 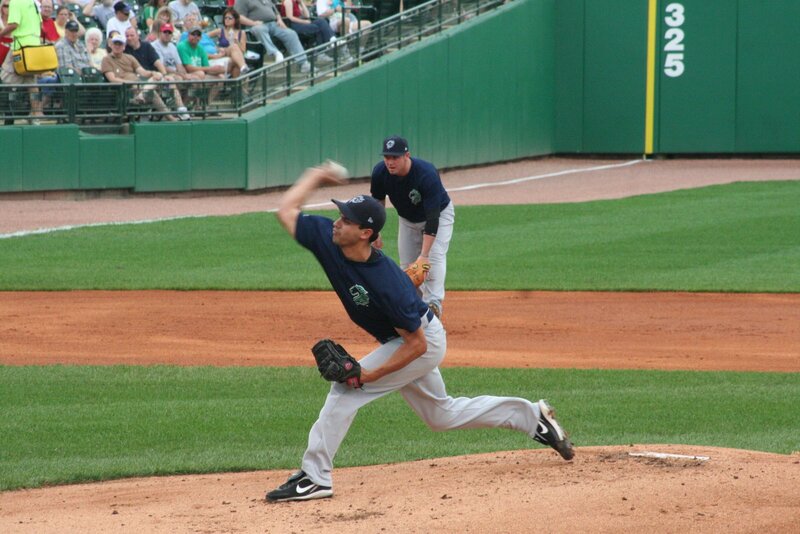 Derek Rodriguez and Ehren Wasserman also pitched well for the Knights. Rodriguez pitched two scoreless innings, and Wasserman pitched a scoreless ninth to get the save. Last week the Sox p icked up Mark Kotsay for Brian Anderson. The team needed to make a roster move to make room for Kotsay. The odd man out in the situation was Josh Fields. With Beckham playing well at third, and Kotsay being able to play first the club really didn’t need Fields at the time. He was sent down to Triple A Charlotte for the time being. In all reality this may be the best thing for him. He can play everyday and work on his swing. He does not see it this way, and requested a trade much like Brian Anderson did when he was sent down the week before. Before the game Fields was talking to some of the fans on the railing about how his wife is very pregnant. Maybe the ch ild on the way is part of the reason Fields wants some kind of job security. He was an exciting player to watch a couple of years ago, and has the tools to be a good player in the league. Last night he went 1-3 at the plate, and also got plunked once. His only hit was a solo home run in the second that put the Knights up 1-0. In the fourth he hit a blast to center that was caught on the wall by Drew Stubbs. Off the bat I thought that he had hit two dingers. 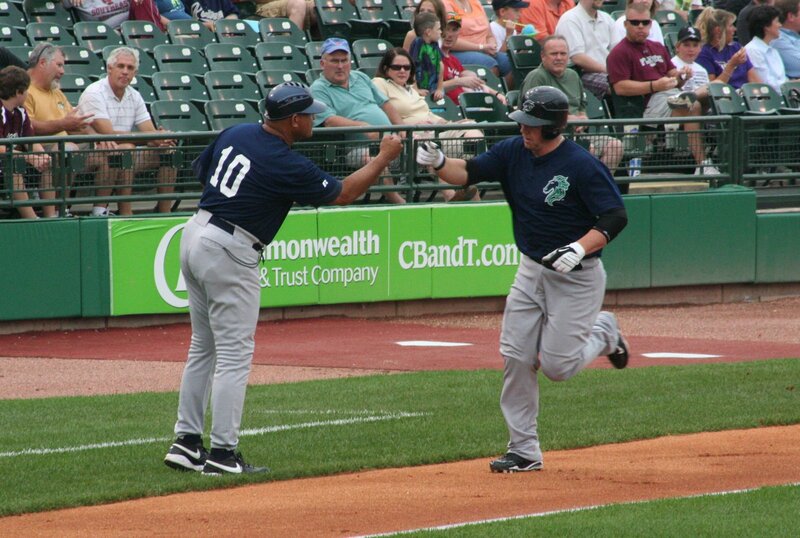 Especially since Michael Restovich had just taken Maloney deep. He also made some nice picks in the field. And thanks to my Louisville Slugger factory tour earlier in the day I can tell you that he is using the Slugger maple bat. On a club that has a few players who may have seen their best days already it was refreshing to see a you ng face. 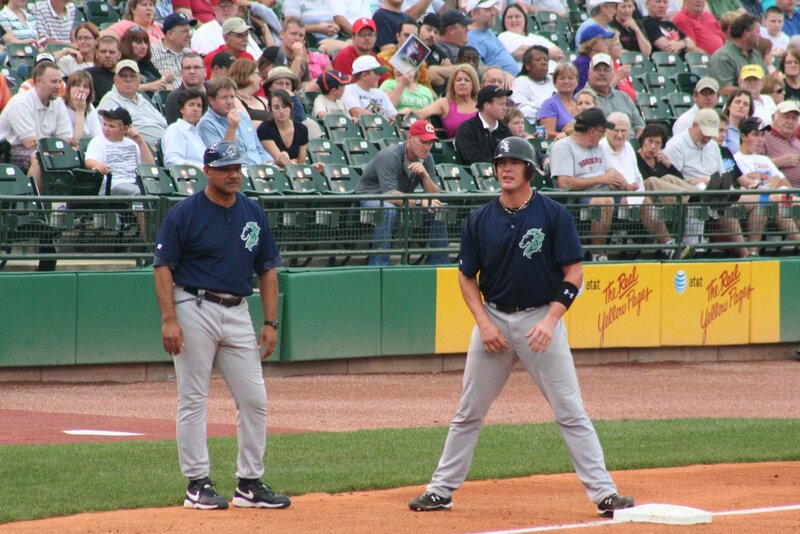 When I went to see the Knights in Toledo I was able to see Gordan Beckham. This time I was looking forward to seeing Tyler Flowers. Flowers was aquired along with Brent Lillibridge in the Javier Vasquez deal. Last winter he apparently really opened Kenny Williams eyes. I have only seen him hit four times after yesterday. What I can say about hiim is that he does not get cheated. He struck out swinging hard in his first at bat, but after the first base coach prodded him on he took first on a wild pitch. He hit a solo home run in his sec ond at bat leading off the fifth, but a great play by center fielder Drew Stubbs brought the ball back into play. He ended up settling for a double, and scoring the deciding run when Norris Hopper hit into a double play. In his other two at bats he hit into a double play and singled. This kid takes a cut. Did I already mention that? He has the classic sluggers swing. Behind the plate is where the concern is on Tyler. Everything that I have read says that he will not be a big league catcher. He did not look too bad. He had one opportunity to gun down a runner, and the throw was on line, but late. The runner got a great jump though so I don’t think that you can pin that on Flowers. He did look a little awkward setting up behind the plate during the game. At least twice he almost went over backwards. He has nothing but time to improve though. I look forward to seeing that bat at the Cell. Another interesting part of the game was watching the exchanges between former White Sox player Corky Miller and some of Knights as they came to bat. He w as on the bench with Josh Fields so you know that they would have something to say to each other. In the second just before Fields hit the home run they had quite an exchange. Fields gave him a bad look right off the bat. Miller must have commented on him being in the minors or something. From then on it was all smiles though. It was also cool to see Miller and Norris Hopper talking to each other. They were both traded for each other a month or so ago. The Reds got a backup catcher, and we got a center fielder. I don’t know who won this trade yet. So far neither team has really gotten much out of it. Many Reds fans were at the game last night. It is not too far of a drive from Cincy to get to the park, and it is a great chance to see the young talent coming up. The Reds have positioned their minor league clubs close to them here in the Midwest. The Dayton Dragons are just a stones throw from the big league park. I wish the White Sox would grab on to this mentallity. We had the South Bend Sox for a few years, but they moved away to become the Winston Salem Warthogs. I think the attendance would be up when you know that some of the guys on the field will someday be playing for your club. It seems like the Reds have everything figured out. Maybe the Sox do too. We trade away so many of our prospects that we would need to go to other clubs farm teams to watch the players that will be on our club someday. This was my first sporting event in Kentucky. As you can see at the bottom of the page the state is now shaded in. I don’t care if it was barely over the Indiana border, it still counts. In some of my pictures the Indiana shoreline can be seen. As a side note Myron Noodleman was at the game tonight. When I planned this trip I looked to see the promotion for it. I was dissapointed in no giveaway, but intrigued by this Myron Noodleman. When I do my weekly promotions posts (coming tomorrow by the way) I always come across his name. I was very curious to see what exactly he did. Well to me he seemed like a Jerry Lewis impersonator at a ball game. He was very good though, and made the nights of many of the fans. If he is coming to your local park go out to the game. His schtick is a little hokey, but so is the game after all. He is the kind of humor that we need a little more of. Posted in Charlotte Knights, Chicago White Sox, Cincinnati Reds, International League, Louisville Bats, Minor League Baseball. The White Sox gave Corky Miller back to the Reds today for center fielder Norris Hopper. 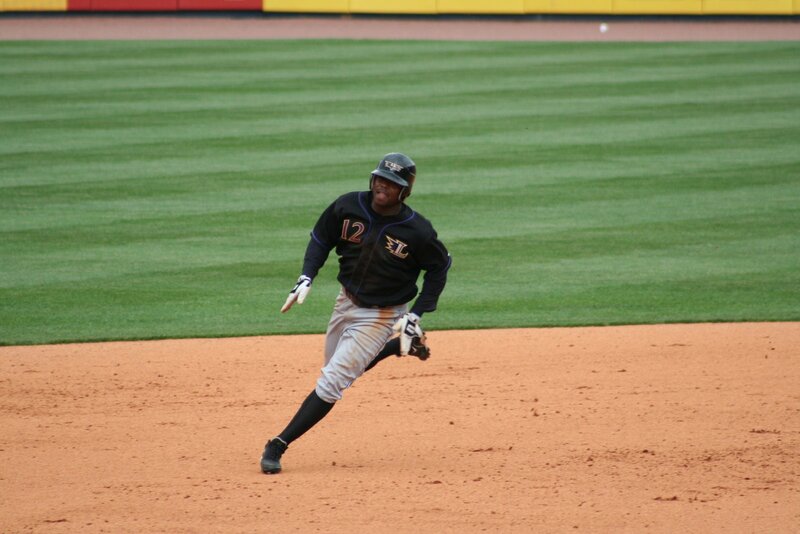 I saw Norris play twice this season when he was a member of the Louisville Bats. 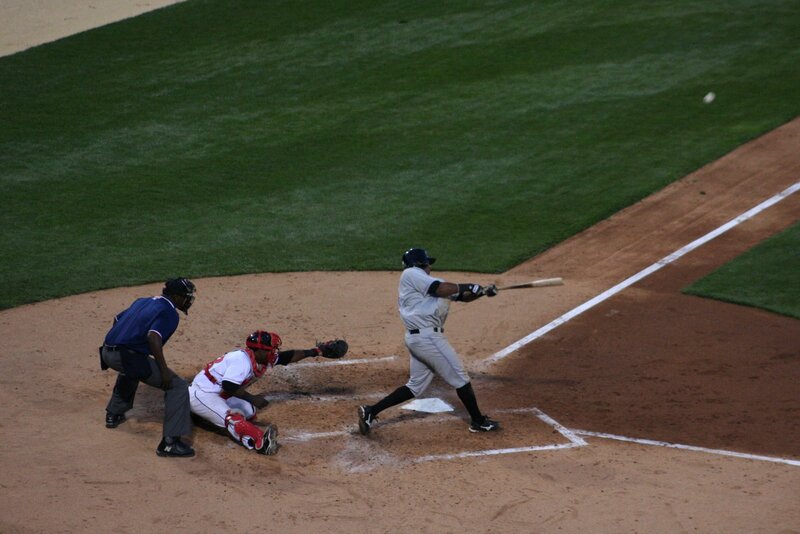 In the two games I saw him he was 3-10 with four runs batted in and one run scored. 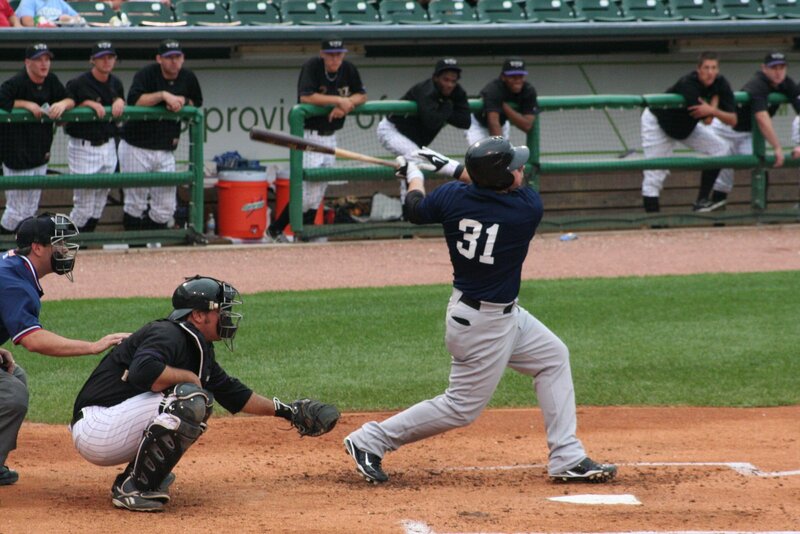 This season in 52 games for AAA Louisville he is hitting .280 with 22 runs scored and 13 stolen bases. It looks as if the Sox are still searching for the answer in center field. Corky Miller despite the humorous name really will not be missed. He never really made a mark on the team in his short stay this year. Posted in Chicago White Sox, Louisville Bats, Major League Baseball, Minor League Baseball. What does that mean exactly? Today I was at the Toledo Mud Hens (Tigers) game against the Louisville Bats (Reds). Homer Bailey was on the mound for Louisville, and boy did he look good. He struck out 15 batters in 6 1/3 innings. He struck out the side in three innings, and just made the Toledo hitters look bad. I heard his name in the off season thrown around as possibly coming to the White Sox, and after seeing him pitch I wish that he would have done just that. The final score was a laugher at 10-3 with Kevin Barker accounting for four of those runs for the Bats. Apparently I am becoming a Bats groupie. Their stadium is just over the border in Louisville so who knows? The way I have been visiting Minor League Stadiums lately it is a possibility. Fifth Third Field is absolutely amazing. So amazing in fact that I don’t want to get into it this late at night. I will talk a little more about the park in a future write up. Posted in Cincinnati Reds, Detroit Tigers, International League, Louisville Bats, Minor League Baseball, Toledo Mud Hens. After threatening to go for years I finally made it to Victory Field tonight. A Triple A club that is 2.5 hours away, and I have never gone. I have been waiting for a weekend series with the Charlotte Knights, but it has not come or I was busy when it did. I decided to go to this game between the Louisville Bats (Reds) and the Indians (Pirates). A future NL Central showdown. Louisville struck for four runs in the first two innings, then were silent the rest of the game. Two errors in the first inning really set the table up for the Bats, and they did not dissapoint. The difference in the game tough was a 2nd inning Matt Maloney home run. What makes that special is the fact that Maloney was the pitcher. In my only other Triple A game Glendon Rusch was pitching for the Iowa Cubs and hit two home runs. I guess minor league pitchers can hit. Former Sox player Danny Richar was 2-4, but I would rather have Getz right now. Victory Field is great. I am glad that I finally was able to get here, and now that I know what I am in for I will be back sooner rather than later. Posted in Cincinnati Reds, Indianapolis Indians, International League, Louisville Bats, Minor League Baseball, PIttsburgh Pirates.